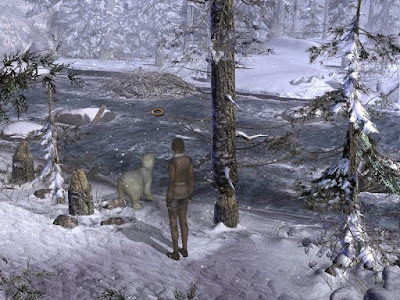 I've finally gotten around to playing Syberia 2, replaying the first game as well while I'm at it (which I'd mostly run through back when they came out) and for better or worse I must say: this is what happens when you let a cartoonist design games. At one point, your "dog" runs off to chase something. You find him by a stream, having chased off a beaver mid-way through chopping down a tree. Turns out it's a stream you need to cross. 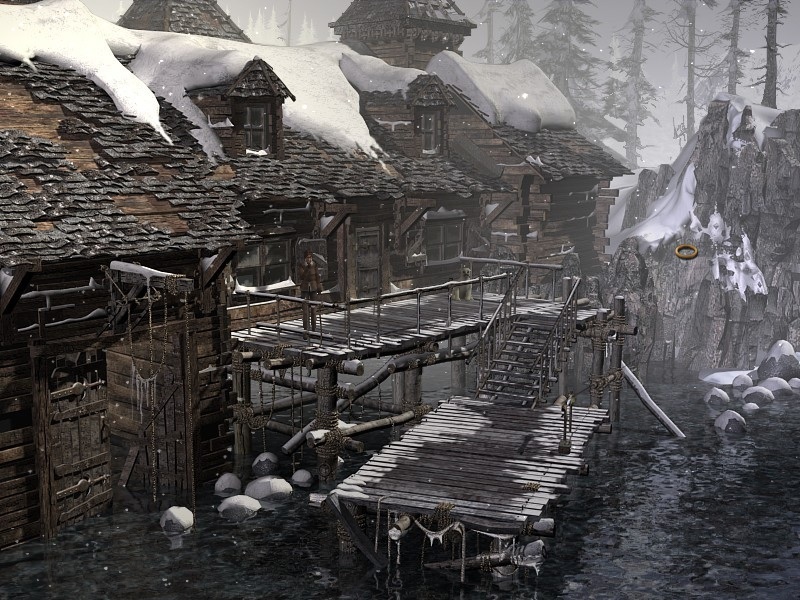 Obviously, you need to somehow finish dropping the tree over the water as a makeshift bridge. You can't interact with the tree. You have a box of matches but you can't set fire to the tree. Your animal sidekick likes fish. You get a fish. Can you pin it to the tree to make the animal knock it down for you? Of course not. You have to walk one screen over, feed the fish to the animal in a completely random location, whereupon it, in its excitement, runs back here where you find the tree mysteriously felled over the water, presumably by the overexcited pet's antics. In a comic book, this would make for an adorable little scene. In an interactive medium, where the player's decisions are supposed to drive the action, it's utterly idiotic. It's a little unfair for me to keep using examples from the second game, as it suffered the usual nosedive in quality we've come to associate with the term "sequel." The sequel is hopelessly mired in such utter randomness and insane pixel-hunting for non-sequiturs. At one point you have to pick up a wooden peg randomly fallen by a pile of clutter, half-buried in the snow, very nearly illustrating a needle in a needlestack. The original made a fair bit more sense and was also a more interesting, more inspired work. Though outwardly centered on an idiot savant's obsession with finding living mammoths in Siberia, the first Syberia used this only as a pretext for a wistful look back at the increasingly forgotten social milieu of early 20th-century Europe. It matches, if anything, the spirit of Grand Budapest Hotel - the wistful, romanticized nostalgia for a largely fabricated world which died before the story's heroes were even born, a proud cosmopolitan creative juggernaut languishing in its own decadence and self-imposed obsolescence. Starting in a little artisanal community in the French Alps dying around its factory of steampunk tinkertoys now being put out of business by electric and electronic gadgetry, you set off to find Hans, the genius who can give life to mere conglomerations of gears. Hans Voralberg himself is busy chasing his own obsession with mammoths, his own dreams of a world forgotten before he himself was ever born. Yet everywhere you go his influence remains, an entire railway of creative genius running through a decrepit self-important university town with the unlikely name of Baroque-stadt, past an overzealous military gatekeeper still waiting for the Cossacks to invade, further through a fuming, wrought-iron ode to self-destructive Soviet industry and its dreams of the stars, to a lavish health spa with a single aging guest and two caretakers. The sequel, on the other hand, was pretty much phoned in. It resigns itself to a mere children's story centered on an adorable big-eyed animal sidekick and a cackling, ugly pointy-nosed villain and the remaining pathos of its major plot twists is completely lost in the sheer frustration of its puzzles, almost all of which have to be brute-forced without any hints or coherent planning. The incessant interruptions of phone calls and cutscenes of Kate Walker's former life as a New York lawyer, annoying but illustrative in the first game, become utterly irrelevant in the second. I am amused at the perhaps inadvertent commentary on idealism the two games embody. 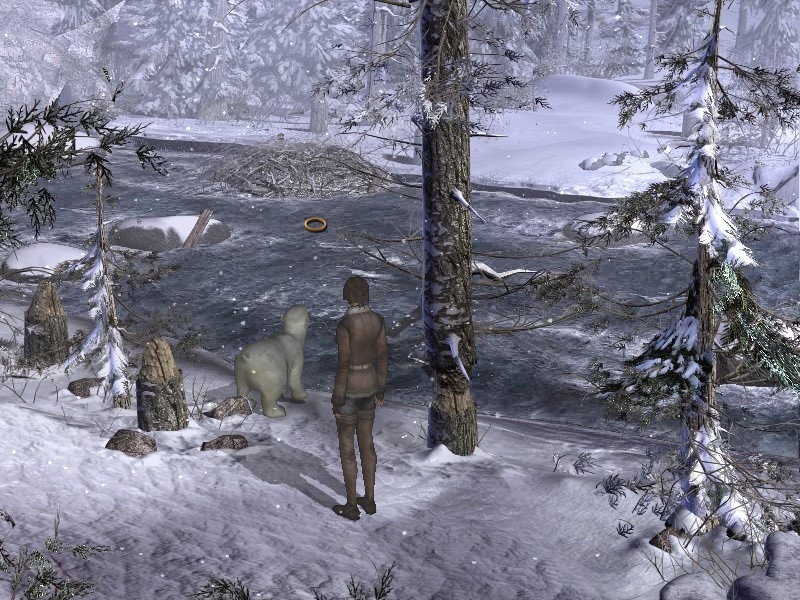 In the first, Siberia and its mammoths stand outside the player's reach. 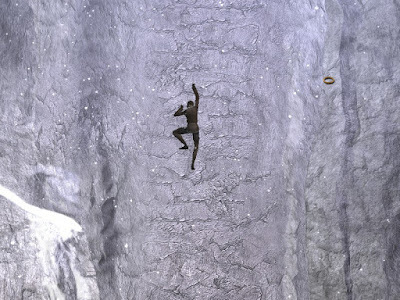 The game itself consists of the race for that grandiose dreamworld of forgotten marvels. Once you reach it, it turns out to be pretty drab stuff. Is Godot worth waiting for? Oh, and if you're going to play and know enough French to catch at least half the dialogue, go ahead and download the French versions. The voice acting's not stellar either way, but the French dialogue flows slightly better.